Your garage door may be one of the sturdiest parts of your home, but even their strong frames will become damaged over time. Extensive use, harsh weather conditions, and even accidents can impede the performance of your doors over time, which makes it necessary to hire trustworthy garage door maintenance services. Our team has the skillset and experience to provide you with excellence in this field, so contact us today to find out more about how we can assist you. As time passes, many of the parts in your garage door will likely suffer damage from wear and tear or weathering. Galvanic corrosion and rust are also a common cause of failing components. Whatever the reason, we can provide the garage door repair parts that you need to improve your door’s condition, and will install them with accuracy and care. As part of our maintenance services, our team conducts minor repairs on parts of your door that can be restored. 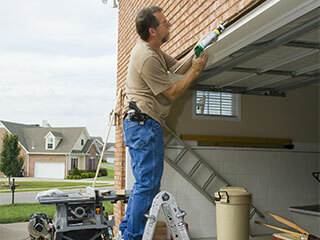 We provide garage door opener repairs, spring, cable, and track repairs, and many other repair and maintenance services. When any of these crucial parts in your door fail, it can leave it inoperable or even unsafe to use, so have one of our technicians handle it for you as soon as possible. Let our technicians assist you with maintaining the condition of your doors through regular inspections and maintenance designed to keep them in running order. We will test safety features, springs, and the balance of your door, to ensure that all maintenance efforts are properly directed to where your system needs them. By doing this, we will not only extend the lifespan of your doors but will also ensure that they can be used safely by you and your family. If you would like more information on our various repair and garage door maintenance services, be sure to contact one of our expert technicians for advice and assistance. Give Garage Door Repair Rogers a call today to find out more about how we can assist you.